Welcome to cocor! This is a website allowing to conduct statistical comparisons between correlations. Click "Start analysis" to begin! The calculations rely on the tests implemented in the package cocor for the R programming language. An article describing cocor and the cocor R package documentation are available. Here you find an overview of all implemented tests. The cocor package also includes a GUI extension for the R front-end RKWard, which you can use instead of this web interface. Are the two correlations overlapping, i.e., do they have one variable in common? These are overlapping correlations because the same variable (age) is part of both correlations. These are nonoverlapping correlations because no variable is part of both correlations. Please choose a null value. The null value is the hypothesized difference between the two correlations used for testing the null hypothesis. 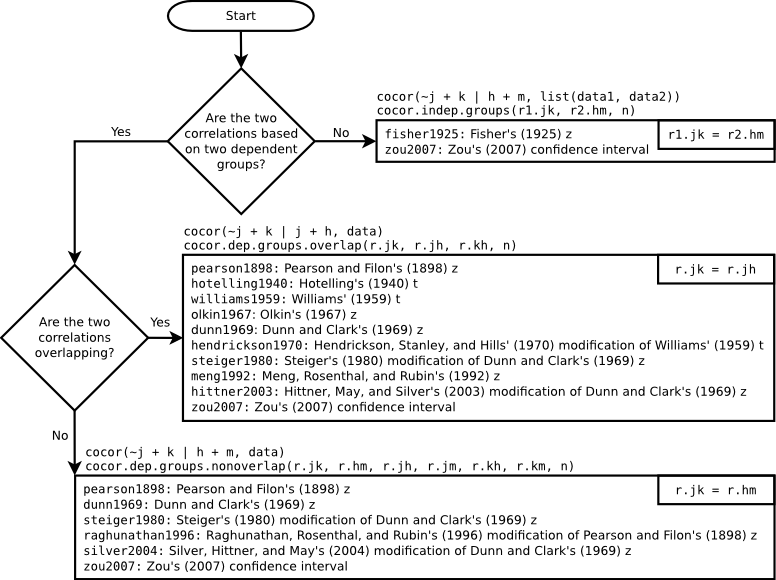 If the null value is other than 0, only the test by Zou (2007) is available. Do you want to conduct a one- or two-tailed test? If you like this web page, you might also like http://comparingcronbachalphas.org a web interface to compare Cronbach alphas.